A splendid pair of fish hook earrings crafted using solid white gold, round cut diamonds and two rare ruby briolette gemstones. These earrings are ideal for all occasions and would be the perfect accompaniment to any jewellery collection. Two natural rubies, total 6.6 ct, two diamonds, SI-1/I, total 0.1 ct for both earrings combined. Briolette cut. 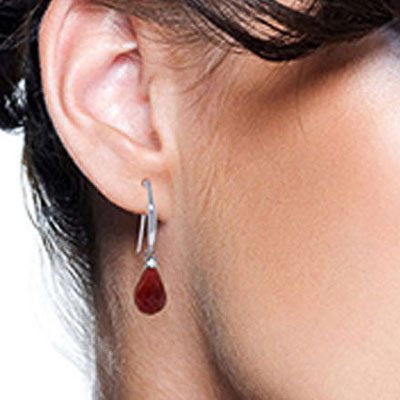 Beautiful earrings, delivered quickly form a reliable jewellers. Beautifully made earrings which represent good value. Nice product my wife was very pleased with her surprise present.